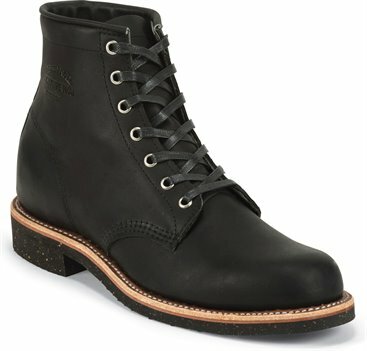 The Black Odessa General Utility Service 6-inch tall men's lace-up boot featuring a polished black leather exterior and thick black waxed cotton laces for durability. It's crafted for comfort with the Texon® Poron cushioned maple leather covered insoles that offer lasting support and the steel shank provides stability. The Vibram® Heritage rubber outsole combines traction and slip-resistance on various terrain with a flexible fit so you're guaranteed freedom of movement. This style is proudly Handcrafted in the USA with imported materials. Great looking boot that is just as comfortable.